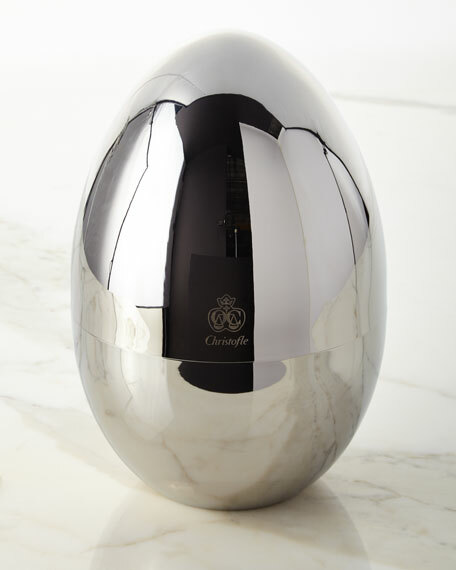 Storage capsule made of polished stainless steel with resin insert; engraved with the Christofle coat of arms and logo. 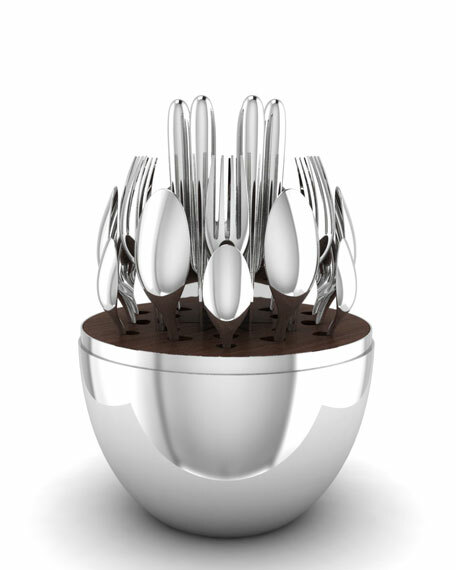 Service includes six four-piece place settings (dinner fork, dinner knife, tablespoon, and teaspoon). Flatware and resin insert, dishwasher safe. 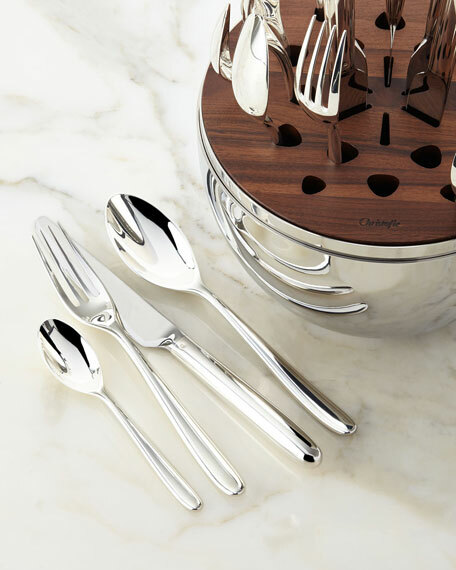 Handcrafted silver-plated flatware service. Stainless steel canister with lacquer plexiglass insert. Limited edition of 1,000 pieces designed by Karl Lagerfeld. 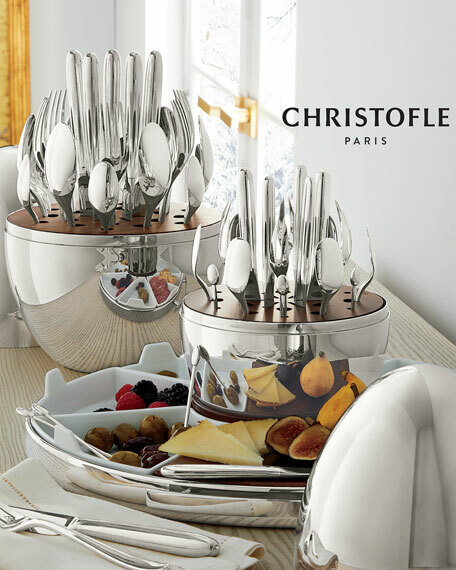 Handcrafted silver-plated flatware service. Stainless steel canister with lacquer plexiglass insert. 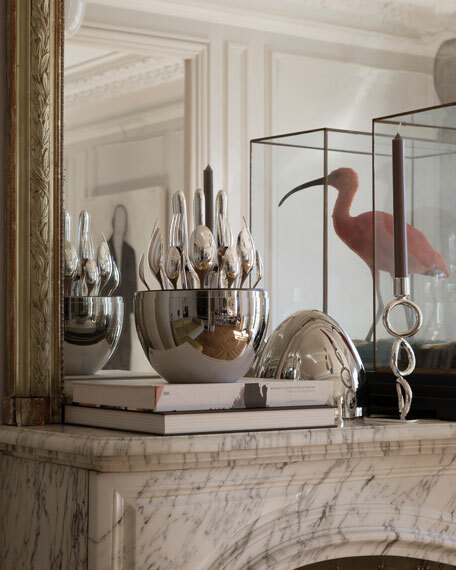 Limited edition of 1,000 pieces designed by Karl Lagerfeld. Each piece numbered. Karl Lagerfeld signature engraved on the side. Engraved mirror polished finish. Six four-piece place settings. Canister: 7.8"Dia. x 11.8"T. Dishwasher safe. Made in France. 24-kt. gold-plated 18/0 stainless steel flatware. Service includes eight 5-piece place settings (salad fork, dinner fork, dinner knife, dinner spoon, and teaspoon) and a 5-piece hostess set (tablespoon, cold meat fork, pierced tablespoon, sugar spoon, and butter knife). Dishwasher safe; hand washing recommended. Imported. Flatware designed by Lou Henry. 18/10 stainless steel. Dishwasher safe. Service includes eight 5-piece place settings (salad fork, dinner fork, dinner knife, place spoon, and teaspoon) and a 5-piece serving set (cold meat fork, serving spoon, pierced serving spoon, butter knife, and sugar spoon). Imported. 18/10 stainless steel flatware. Service includes eight 5-piece place settings (salad fork, dinner fork, dinner knife, dinner spoon, and teaspoon) and a 5-piece hostess set (tablespoon, cold meat fork, pierced tablespoon, sugar spoon, and butter knife). Dishwasher safe. Imported.